Turns out there's a price to pay for upending the District's voter-approved measure to legalize marijuana. WASHINGTON — Turns out there’s a price to pay for upending the District’s voter-approved measure to legalize marijuana. Rep. Andy Harris, R-MD, may have to hit the road for a bike tuneup. At least that’s what the sign says at one shop on Barrack’s Row. 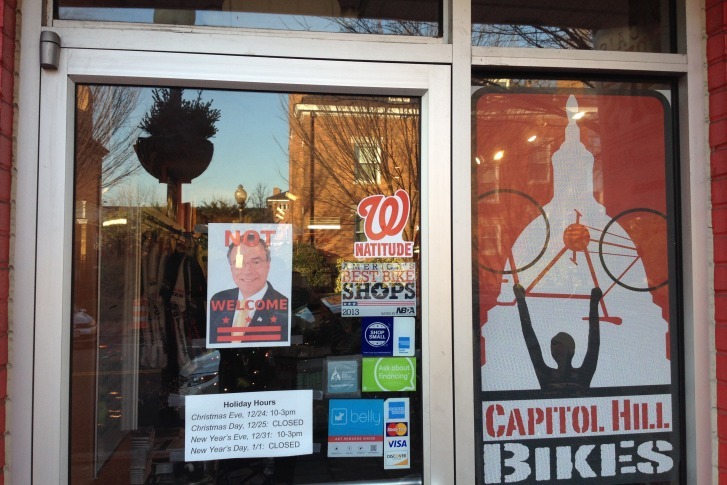 “This is just a little political protest that we have here, and we think in general this is a sentiment that is District-wide,” says Brian Ward, the sales manager at Capital Hill Bikes. In November, voters approved Initiative 71 by a margin greater than 2-to-1, legalizing marijuana for recreational use. But in the spending bill Congress passed last week, a few short sentences upended that law. Harris was influential in making it happen. “It’s not even just about Initiative 71 but more generally speaking about how Congress likes to stick their noses in the District’s affairs,” Ward says of the sign. Harris co-wrote an op-ed piece in the Washington Post defending his effort. And if he actually did need some tweaks on his bike, the shop says it wouldn’t keep him out. “If he wants to get a tuneup he can get a tuneup, but he’ll probably hear some words from us,” Ward says with a laugh.